President Franklin Roosevelt was admired as a humanitarian–yet he shut America’s doors to Jews fleeing the Holocaust. He called himself the champion of “the forgotten man,” but when it came to the Jews under Hitler’s jackboot, FDR turned away. 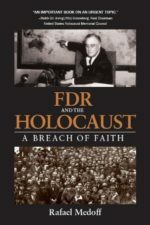 Dr. Rafael Medoff’s new book reveals starting new evidence about FDR’s most shameful hour–his willingness to turn a blind eye to the systematic annihilation of six million European Jews. Medoff’s groundbreaking research has uncovered documents revealing FDR’s private opinions about Jews–shocking new evidence that pulls back the curtain on why he refused to admit refugees or bomb the railways leading to Auschwitz. This gripping historical account of the real story of President Roosevelt’s record on the Holocaust is a stunning expose of how FDR could have saved many innocent lives, yet chose not to. religion correspondent and author of The Search for God at Harvard. TO ORDER: Available for $15 plus $2.50 postage from the Wyman Institute. Click here to order.